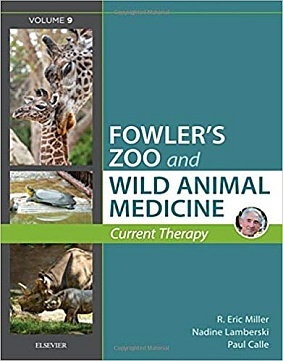 Bringing together a globally diverse range of timely topics related to zoo and wild animals, Fowler's Zoo and Wild Animal Medicine, Volume 9 is an invaluable tool for any professional working directly with wildlife and zoo animals. The text's user-friendly format guides readers through biology, anatomy, and special physiology; reproduction; restraint and handling; housing requirements; nutrition and feeding; surgery and anesthesia; diagnostics, and therapeutics for each animal. Two new co-editors and a globally diverse group of expert contributors each lend their expertise on a wide range of new topics - including a new section on emerging wildlife diseases covering topics like MERS, Equine Herpesvirus, and Ebola in great apes. Other new topics integrated into this ninth volume include: stem cell therapy in zoo medicine, cardiac disease in great apes, disease risk assessment in field studies, Tasmanian devil tumors, and the latest information on the elephant herpes virus. With all its synthesized coverage of emerging trends, treatment protocols, and diagnostic updates new to the field, Fowler's is a reference you don't want to be without. ・NEW! Two new co-editors (for a total of three editors) each lend their expertise on a wide range of new wild and zoo animal topics. ・NEW! Section on emerging wildlife diseases includes chapters on MERS, SARS, Ebola in great apes, and a variety of other emerging wildlife diseases. ・Current therapy format ensures that each CT volume in the series covers all new topics that are relevant at the time of publication. ・Synthesized topics offer the right amount of depth - often fewer than 10 pages - to maintain an accessible format. ・General taxon-based format covers all terrestrial vertebrate taxa plus selected topics on aquatic and invertebrate taxa. ・Updated information from the Zoological Information Management System (ZIMS) has been incorporated to keep readers up to date on this worldwide system. ・Globally diverse panel of expert contributors each incorporate the latest research and clinical management of captive and free-ranging wild animals throughout the world.